Chinese entrepreneur An Yanshi is convinced he has found the key ingredient to produce the world’s most expensive tea – panda poo. The former calligraphy teacher has purchased 11 tonnes of excrement from a panda breeding centre to fertilise a tea crop in the mountains of Sichuan province in southwestern China, home to the black and white bears. An says he will harvest the first batch of tea leaves this spring and it will be the “world’s most expensive tea” at almost 220,000 yuan (US$35,000) for 500 grams. The 41-year-old, who is so passionate about his new project he dressed in a panda suit for his interview, has been ridiculed by some in China for his extravagant claims of the potential health benefits of the tea. 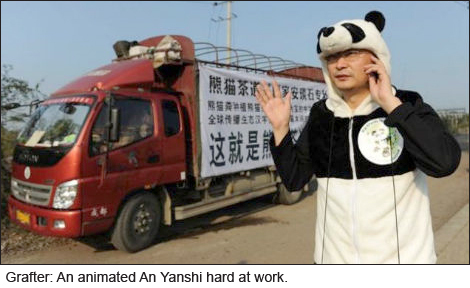 But he insists he is deadly serious, saying he quit his job at Sichuan University to throw himself “heart and soul” into his company, Panda Tea, whose logo features a smiling panda wearing a bow tie and holding a steaming glass of green tea. While An hopes to make money from the tea, which he has planted on just over a hectare of land, his main mission is to convince the world to protect the environment and replace chemical fertilisers with animal faeces – before it is too late. “Panda dung is rich in nutrition… and should be much better than chemical fertilisers,” An said as he sat at a traditional Chinese tea table drinking tea grown with cow manure. “People should make a harmonious relationship with Heaven, Earth and the environment,” An said. “Everybody has an obligation to protect the environment,” he added, as he showed AFP dozens of traditional Chinese scroll paintings that he has created of cheerful-looking pandas, bamboo and calligraphy. The tea aficionado got the idea to use panda faeces as fertiliser after attending a seminar last year where he discovered that the bears absorbed less than 30 percent of the bamboo they consumed, excreting the remaining 70 percent. An showed a glass jar of fresh-looking panda faeces, which he uses to fertilise two tea plants in his office, noting the “quality” and “green” colour of the dung. “If it is such a good fertiliser for tea plants, I want to ask this teacher: why don’t you just eat panda dung? Then you can get the rest of the 70 percent nutrition,” a web user called Baihuashu said. “After the first batch is harvested, if the quality is really good, we will expand the economies of scale,” said An, waving his panda paws for emphasis.